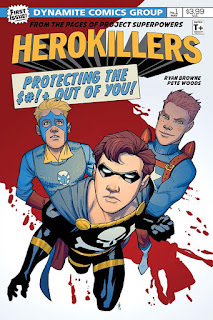 The Fellowship was fortunate enough to obtain a copy of PROJECT SUPERPOWERS: HERO KILLERS #1 from Dynamite Entertainment. Ryan Browne writes, Pete Woods draws and colors, and Crank! letters. Libertyville was a town in trouble, so it offered superheroes a steady job fighting crime. But too many of them took them up on the offer, and now there are way too many of them trying to fight too little crime. Then a group of sidekicks are hanging out when they discover a supervillain plot, and they take him out on their own. When one of the heroes shows up and tries to take credit, the sidekicks are having none of it. It's hard to tell if this is a story about the dangers of handling superpowered people, or the dangers of sidekicks, AKA teenagers with super powers. This issue uses both ideas to hilarious effect, and super comedy is not an easy sub-genre to pull off. But it manages to be relevant as well as self-parodying, and the art adds many pieces of both puzzles to the mix. These kids are going to be in a ton of trouble if their secret comes out (especially Tim, but maybe he can plead that one down a bit, if he can get a good lawyer). This book is a hoot, so go pick it up. PROJECT SUPERPOWERS: HERO KILLERS #1 is available now from your local comic shop, or online at dynamite.com.